WAIALAE COUNTRY CLUB. This country club is world famous for the "Hawaiian Open" golf tournament. The club is adorned with a wonderful collection of art and sculpture from artists living in Hawaii chosen and commissioned by Mr. Adams. 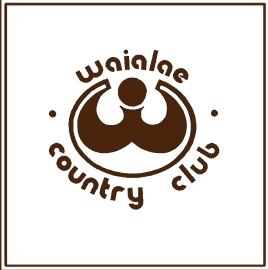 Of particular note is the new logo designed for the club which replaced a conglomerate symbol which combined an English crown, crossed golf clubs, waves, and a "mud hen" which is the translation of Waialae. The new logo synthesizes these elements into a single emblem based on the feather cape worn by "Alii" - the kings. This cape is topped by a golf ball symbol. The pattern on the cape also can be seen as the letter "W" for Waialae. Thus one emblem bespeaks Hawaiian heritage, royalty, golf, and the instantly recognized "W."
ZIPPYS. 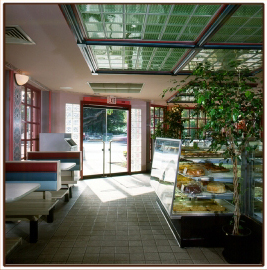 This renovation of a popular "fast food" restaurant gave the property entry into a new market niche. The alterations included enclosing the street side corner, taking advantage of an existing row of palm trees. The atrium effect was heightened by the use of glass block framing the entry doors. This glass block detail was then repeated in the ceiling with a special light-weight plastic version of the block as back light sky light. A custom designed border treatment was hand stenciled for accent. The overall renovation was both durable and beautiful.